Being organized can be difficult, especially as a blogger. Trying to organize your home life, and then trying to organize your blog ideas (posts, design, etc) can get overwhelming. And sometimes the two worlds collide, and you are trying to write blog posts about projects you’re doing around the house. Things can get a little chaotic. I decided I wanted to make a project board to help keep things organized. Of course I didn’t want to spend a lot of money on it, so I got to thinking. I wanted something I could stick (and importantly, un-stick) blog post ideas to. First things first: if it’s a beautiful spring day, take your supplies outside and enjoy the sunshine! You have a couple options as far as assembly goes. 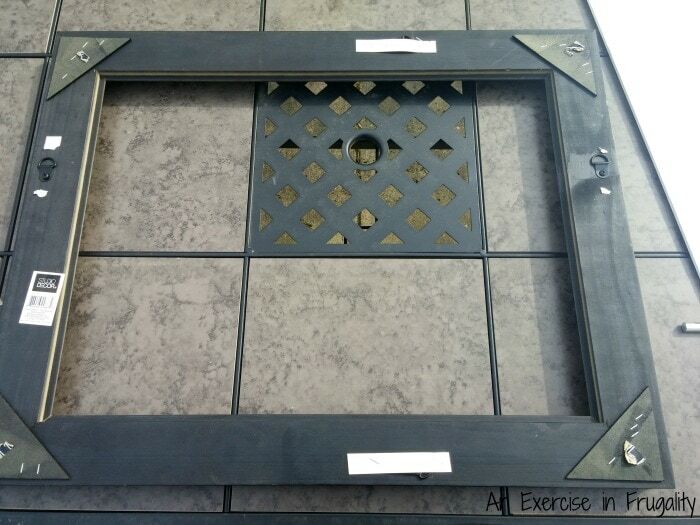 you can measure and cut the foam board to fit within the frame, or you can take the lazy way like I did and simply adhere the foam board to the back of the frame. 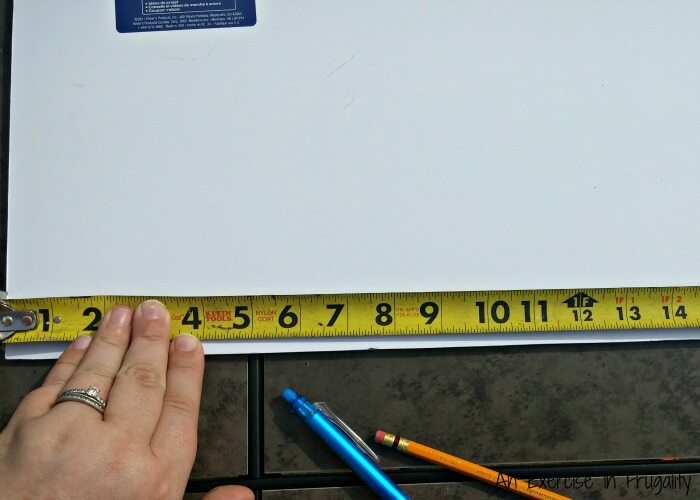 Instead of a frame, you can leave the board plain or you can decorate it with washi. 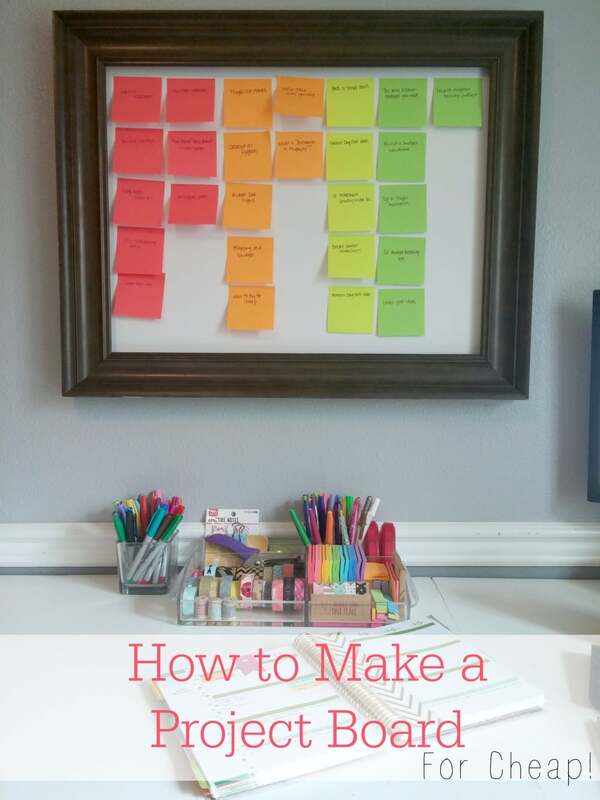 Then just hang your frame (I used Command strips) and start sticking on your post it notes. 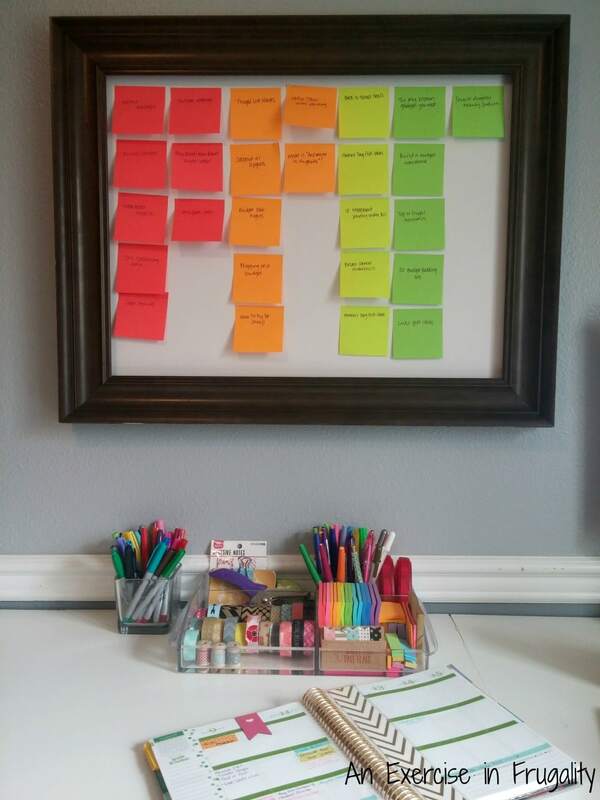 You can use this board to track blog post ideas, or menu planning, or managing household projects. Whatever your heart’s desire! 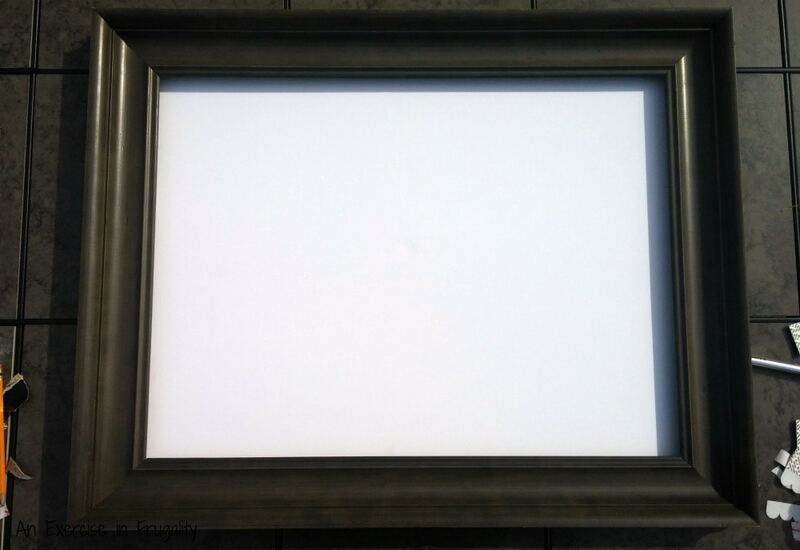 I was able to find my frame on clearance at Michael’s, but you can use a frame from Goodwill, or one you have laying around or skip the frame altogether. I didn’t decorate mine because I wanted to maximize the amount of space available for post it notes, but I may go back and add some washi tape, I haven’t decided yet. I have all my blog post ideas color-coded by type. Now I can brainstorm blog ideas, and they don’t get lost in the back of my planner because they are RIGHT IN MY FACE in pretty neon colors. No more losing them written on scrap paper either. And when I’ve completed a post about one of the ideas, I just toss the post-it note. I’m really digging this new system! What do you think of my new blog idea board? Love this idea! I am all about lists, and with homeschooling my little ones, I always have spiral notebooks on hand, and end up making list after list in those notebooks. I splurged recently and bought an EC Deluxe Notebook with calendar to try and be more organized with blogging, so far it is working out pretty well!